More recently, community health workers (CHWs) have become popular as a cost-efficient solution to help high-risk vulnerable patients navigate the healthcare system. Evidence has shown that CHWs can be successful in connecting patients to ambulatory care and reducing subsequent hospital utilization following discharge.12-15 CHWs differ from patient navigators in that they are typically trusted lay members of the community who liaise between health and social services to provide aid and support consistent with patients’ values and needs.16-18 Combining the roles of patient navigators and CHWs may maximize the efficiency and effectiveness of programs intended to aid vulnerable populations, such as super-utilizers. The Familiar Faces program worked to address the needs of the community by blending the roles of CHWs and patient navigators into a single role of community navigator. Similar to CHWs, the community navigators employed by the Familiar Faces program are members of the community, with some having medical training and others having nonmedical professional experience. In addition to connecting clients to health and social resources in their community, the community navigators focus on building trust between the client and navigator and subsequently with other healthcare entities and social systems in the community. However, unlike CHWs, the community navigators are employed and embedded within the hospital system and receive the training often provided to patient navigators, such as background education on the role of patient navigation, motivational interviewing, ethical decision making, health literacy, client communication strategies, professional conduct and boundaries, and client resources. To be eligible for the Familiar Faces program, an individual had to have 11 or more MLH hospital encounters originating in the emergency department (ED) during a predetermined 1-year screening period (ie, be a super-utilizer) and be a resident of the 38109 zip code. There were 2 cohorts of Familiar Faces clients served by the program, with additional cohorts currently in progress. Clients in cohort 1 (n = 84) were identified between May 1, 2012, and April 30, 2013, and began receiving services from the first community navigator in January 2014 (Figure). Clients in cohort 2 (n = 75) were identified between January 1, 2014, and December 31, 2014, and began receiving services on January 1, 2015, from a second community navigator. Upon the start date for each cohort, when an eligible Familiar Faces client had an encounter at an MLH hospital, the electronic health record (EHR) system notified the community navigator via text message to meet the client in the ED or in the hospital if they were admitted for observation or to an inpatient setting. The community navigator then engaged with the client to create a partnership by offering their services. If the client accepted, they became part of the Familiar Faces cohort. If they declined, the community navigator would continue to receive text messages each time they returned to the ED, and they would again engage with the client about their services. Ultimately, only 3 clients refused services when approached by the community navigators during the intervention period. The goal of the client–community navigator partnership was to identify underlying causes for frequent ED encounters and to develop a plan to change clients’ health behaviors. The services offered by the community navigators included linking clients to community resources, helping to identify and eliminate barriers to health, coordinating care, tailoring health information to client needs, and motivating them to make healthy choices. This partnership was designed to last for 1 year following the initial engagement of the client, at which point the clients would ideally be prepared to manage their own care moving forward. The purpose of this study was to ascertain the effectiveness of community navigators in reducing hospital utilization and costs in super-utilizers. To determine the impact of the program, we compared MLH hospital utilization and costs of Familiar Faces clients in the year before and after they worked with a community navigator. To control for typical patterns in utilization and costs in super-utilizers, we compared the changes in utilization and costs observed in Familiar Faces clients with similar data for super-utilizers in contiguous zip codes. Clinical data were obtained from the MLH EHR system (Cerner Corporation; Kansas City, Missouri) and total costs were obtained from the CostFlex System (CostFlex Systems, Inc; Mobile, Alabama). Data queries were constructed in both systems to extract and match clinical and cost data for Familiar Faces clients based on unique medical record and encounter identifiers. To act as comparison groups, during the same screening periods as those establishing cohorts 1 and 2, we abstracted clinical and cost data for all individuals who met the criteria for a super-utilizer (n = 280) from contiguous zip codes: 38106 (n = 83), 38114 (n = 61), 38116 (n = 111), and 38126 (n = 25). Comparison group individuals for cohorts 1 and 2 were selected without replacement (ie, are unique patients). We did not abstract comparison group individuals from the 38109 zip code who were either already enrolled in cohorts 1 or 2 or were being engaged in enrollment into future cohorts. 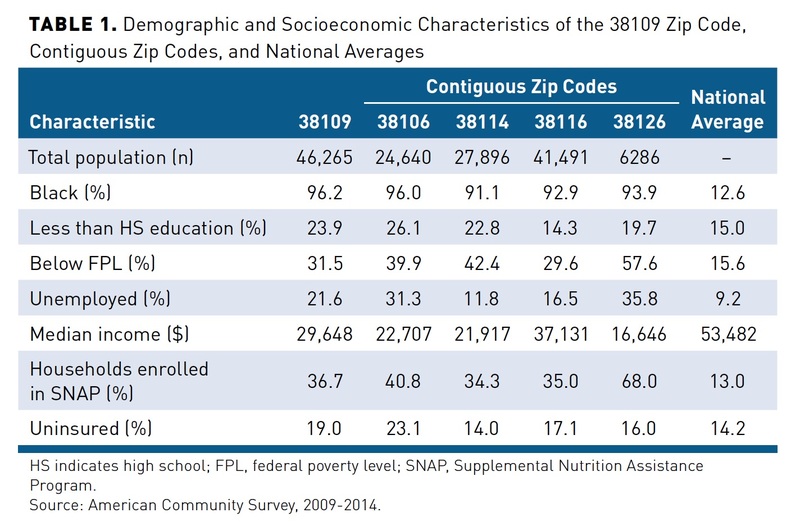 Table 1 describes characteristics of the 38109 zip code, the contiguous zip codes, and national averages. 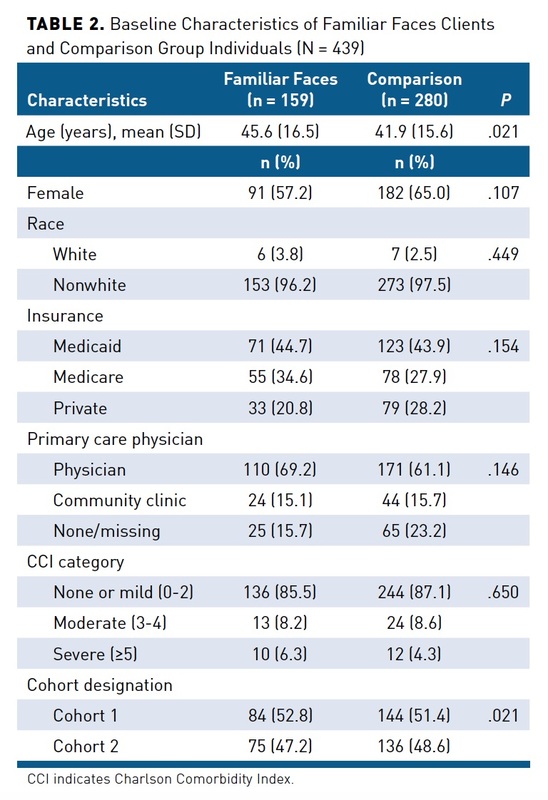 From the clinical data, we abstracted patient demographics (age, gender, and race), insurance status (Medicaid, Medicare, or private insurance), and self-reported primary care provider (PCP) category (having a usual PCP, using a community clinic, or having no PCP). Individuals with no PCP information were categorized as having no PCP. We also created a Charlson Comorbidity Index (CCI) score for each patient and categorized them as having no or mild comorbidity (0-2), moderate comorbidity (3-4), or severe comorbidity (≥5). We also adjusted for the raw CCI score, and our results did not change substantively. We used clinical data to assess the number of MLH hospital encounters for each patient for 1 year pre- and post intervention; hospital encounters were then stratified by whether the patient was ultimately discharged from the ED or admitted for observation or an inpatient stay. We also assessed 30-day readmissions, total hospital days, average days between hospital encounters, and total costs of care for the pre- and postintervention time periods. Chi-square and t tests were used to test for significant differences in baseline categorical and continuous variables, respectively, between intervention groups. We then calculated average utilization rates for the intervention and control groups during the pre-intervention and postintervention periods. Using a difference-in-differences (DID) approach, we estimated the relative difference in utilization rates from the pre- to postintervention period for the intervention (difference 1) and control groups (difference 2) and the relative difference between the 2 groups (DID = difference 1 / difference 2). Using a generalized linear model, the DID estimate is the coefficient on the interaction term between intervention status and pre- versus postintervention indicator. We employed a log-link in the generalized linear model to estimate relative rates for utilization outcomes. We also considered a Poisson regression model, and our results did not change substantively. Relative changes are presented as relative rate reductions ([1 – relative rate] × 100%) or relative rate increases ([relative rate – 1] × 100%) if the relative rate was less than or greater than 1, respectively. We estimated the average annual costs per patient incurred by the intervention and control groups pre- and post intervention. Similarly, we used a DID approach to estimate the pre- versus post­intervention differences in costs for the intervention Familiar Faces clients (difference 1) and control group (difference 2) and the absolute difference in costs between the 2 groups (DID estimator = difference 1 – difference 2). Because the cost data were skewed, we explored generalized linear models with a log-link and other models for count data, such as Poisson and negative binomial regression models. Our results using these alternative model specifications did not change our findings substantively. We repeated the analysis in cohorts 1 and 2 separately, and our results were similar, except many results were not significant due to lower sample size (eAppendix Table 1 [eAppendices available at ajmc.com]). We also used propensity score methods (regression adjustment and inverse probability treatment weighting) as alternative methods to control for confounding between intervention groups, and our DID estimators were not substantively different (eAppendix Table 2). In all analyses, we considered a 2-tailed P value of .05 to be statistically significant. All analyses were conducted with SAS version 9.4 (SAS Institute, Inc; Cary, North Carolina). This study received approval from the joint University of Tennessee Health Science Center and MLH institutional review board. The baseline characteristics for the intervention and control group individuals can be seen in Table 2. Although the groups were relatively similar in all baseline characteristics, Familiar Faces clients tended to be slightly older than control group individuals (45.6 years vs 41.9 years; P = .021). The pre- and postintervention utilization rates for the intervention and control groups can be seen in Table 3. Pre-intervention utilization and costs were not statistically different between the groups. Total encounters declined significantly for Familiar Faces from 18.7 per year in the pre-intervention period to 11.4 in the post­intervention period, yielding a 39% reduction in total encounters. Total encounters also fell in the comparison group from 17.6 to 12.3 encounters in the pre- and postintervention periods, resulting in a 30% reduction in total encounters. Comparing intervention with control data, total encounters in Familiar Faces clients fell by an additional 13%, after accounting for patient characteristics. This effect remained whether individuals were discharged after their ED encounter (–12%) or were admitted for observation or inpatient stay (–12%). Reductions in 30-day readmissions were also significant in both groups. Familiar Faces clients had an 18% greater reduction, although this difference was not statistically significant. Familiar Faces clients also had a significantly greater reduction in number of hospital days (–8%) and a greater increase in days between encounters (9%) compared with the control group. 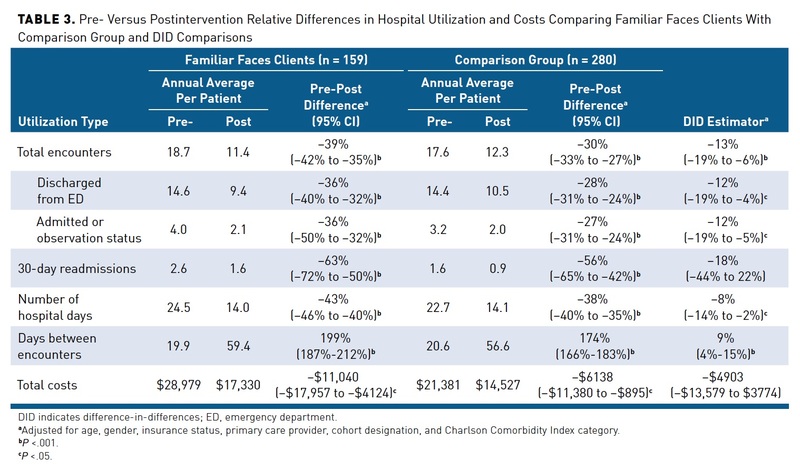 Analysis of cost data revealed that both the intervention and control groups had significantly lower hospital costs in the postintervention period, and this finding was consistent across all cost categories (Table 3). Familiar Faces clients’ costs fell by an additional $4903 in the postintervention period compared with the control group, but this difference was not statistically significant. Our findings suggest that community navigators may represent a clinically meaningful and potentially cost-saving solution to reduce hospital utilization in super-utilizers. Super-utilizers working with community navigators in our study had significantly fewer hospital-based encounters and hospital days and experienced longer gaps between subsequent hospital encounters compared with similar super-utilizers in neighboring low-income communities. We also found that community navigators were able to reduce 30-day hospital readmissions and hospital costs for their clients compared with similar super-utilizers, although these differences were not statistically significant. Our findings were similar in both cohorts of Familiar Faces clients, who were assisted by different community navigators, suggesting that the program can be replicated. The Familiar Faces program offers an innovative approach for combining the traditional roles of patient navigators and CHWs into a community navigator who provides high-needs patients living in particularly high-risk and underresourced geographic regions with a more holistic approach to health. Strategies to reduce utilization and costs in super-utilizers require care management, addressing social determinants of health, and moving the point of care from the hospital to preventive and ambulatory care settings.22-24 The purpose of community navigators in the Familiar Faces program is to bridge the gaps between their clients and the healthcare and social systems that are often fragmented and difficult to navigate. Furthermore, integration of community navigators into the healthcare system, specifically the information flow offered by EHRs, ensures that community navigators are able to engage with patients during acute episodes of care, when their needs are greatest. In addition to the expertise that community navigators provide to clients in navigating healthcare and social systems, they may build trust between clients and the healthcare system, as they live in the same communities as their Familiar Faces clients. Mistrust of the healthcare system is often high in minority and low socioeconomic populations and may result in delayed medical treatment and use of fewer preventive services.25-28 A recent study also found that medical mistrust, which was more prevalent among African American patients, accounted for a significant portion of the increased ED use in African American compared with white patients.29 Because the community navigator was simultaneously a member of the community and the healthcare system, it is possible that they were able to reach community members particularly mistrustful of the healthcare system and start to build a foundation of trust. Future studies should explore the mechanism by which community navigators are able to achieve meaningful reductions in hospital utilization in super-utilizers. Our study findings also demonstrated the need to identify super-utilizers before episodes of high utilization, as their needs are acute but temporary. We found that utilization and costs decreased significantly from the pre- to the postintervention period in both Familiar Faces clients and control group individuals. These findings confirm those of a previous study that found that super-utilizers initially requiring substantial healthcare resources did not continue to require intense medical treatment in subsequent months.36 EHR systems with predictive algorithms may provide a solution to predict high utilization in patients before they become super-utilizers.22,37 Future research should explore this opportunity and investigate whether community navigators intervening before predicted episodes of high utilization is a clinically feasible and cost-effective solution for potential super-utilizers. There are limitations to our study that should be considered. First, because this was not a randomized trial, our findings may be confounded by factors not considered in our analysis. However, the similarities in characteristics between intervention groups and zip codes, combined with our strong observational study design (DID) and sensitivity analyses, lend credence to our findings. Furthermore, the Familiar Faces program was not designed with statistical power in mind, which may explain our lack of statistical significance for reductions in readmissions and costs. Second, we assumed the date of the postintervention period to be the first date in which community navigators approached individuals identified as potential Familiar Faces clients during the screening period. However, full participation could have begun in the weeks and months following this date. Furthermore, the gap between screening and implementation in cohort 1 likely attenuated the effect of the intervention toward the null, as these patients may have already begun to reduce utilization, which was reflected in our cohort-specific findings. Third, baseline annual costs were slightly lower (but not statistically different) in control group individuals compared with Familiar Faces clients, and our findings in costs may be due to regression to the mean. However, although baseline costs were higher in the intervention group, utilization rates were relatively similar. Fourth, we could not examine utilization in other hospitals or outpatient settings, but an internal analysis from the local health information exchange (Mid-South e-Health Alliance) did not find ED visits for these individuals in other participating hospitals. Lastly, we were unable to consider other outcomes, such as quality of life, patient satisfaction, and functional status. Although the healthcare needs of super-utilizers may be acute and somewhat temporary, community navigators can reduce subsequent hospital utilization and potentially save costs. This novel approach appears to provide significant clinical benefits for the high-needs patients as well as potential cost savings to health systems. Future studies should explore trust as a possible mechanism for the effectiveness of community navigators in this population. Expansions of this model should examine the model’s effectiveness in other populations and outcomes to confirm and complement our findings.